Reselling Property within 3 years of buying? When I met one of my friends last week, he was very happy that he is making a huge profit on one of his property investments. He bought a 3BHK Flat in Bangalore in 2012. He purchased the property for Rs 50 Lakhs (including registration & brokerage charges). Now, he is reselling it for Rs 80 Lakhs. The holding period is less than 3 years. We need to consider income-tax rules before arriving at the actual profit to be made. I f you had taken a home loan then you need to calculate the total interest paid for the holding period.This is an expense.We need to subtract this amount from the expected profit. Let us assume that my friend has taken a home loan of Rs 40 Lakh. Loan tenure is 20 years. The interest rate is 10.5%. The EMI (Equated Monthly Installment) is Rs 39,935. EMI has two components, Interest and second one is Principal component. The total interest repayment in the last 2 years in his case (2012 to 2014) was Rs 7,93,375. This point is applicable if you had claimed the Principal component of EMI under Section 80c. If the property is sold within five years of buying then the tax deduction benefits that you have claimed in the previous years are reversed. That means, the total principal amount claimed in the last two years under Section 80c will be added back to your salary. In the above case, the total Principal amount claimed as tax deduction for two years was Rs 1,25,134. This amount is added to your salary/income. As per your income tax slab, you need to pay tax on this amount too. So, the profit on sale transaction would still come down. In the above case, my friend is planning to sell the property within 3 years, so he is making short term capital gains from the transaction. If you sell a property within 36 months of buying it, the profit is added to your income for that year, and taxed as per your income tax slab rate. Let us now calculate the actual final gain, after considering the above charges and tax liability. In the above example, my friend may get returns of around 14% pa from this transaction. But, do not invest in real estate investments for quick short term gains. It is unrealistic to expect these kind of returns in short term. Do not get carried away by stories of friends or colleagues who made lakhs within a year of property investment. It is advisable to stick to your investment for the long term. Do your calculations before selling your property if it is within 3 years of buying. You may use the below calculator to calculate the total interest / principal repayments of a specific duration. Already you have cleared so many queries, but still some queries popped up 🙂 Thank you for good financial guidance so far…..
Could you please help me with my query on Long term capital gain exemption (LTCG)…. 1. I purchased a plot in 2010 in 2 lacs which excludes the Stamp Duty & Registration amount. 2. I have recently purchased a new flat in Jan, 2017 (Possession) while registered in June, 2016. Also taken Home loan worth 33 Lacs. Now i want to sell out my plot and tentative expected amount is 12 lacs. A. Can i use the complete amount which i received as Long Term capital gain to pay some part of my Home loan as part- payment. In this case will my complete LTCG amount will be tax exempted? (12 lacs – 2 lacs – Legal payments during purchasing of flat)? C. What is the date considered for calculating the new property purchased prior to sale of plot. Is it Date of Registry for flat or Date of possession? C – As you are selling the property after possession, date of registration can be considered for CG. Kindly read : Under-construction of property & Tax implications. I’ve bought one 20 years old flat in 2014 by taking home loan and getting nominal rent. and I also bought another 15years old flat by taking another home loan and that too given on rent because I transfered to another city. But both flats annual maintenance, renewation, property tax altogether’s cost is almost equal to what i get as rent. sometimes iam not getting rent because it’s vacant. now iam in a rent house in other city and showing HRA for tax exemption. in this case I have some doubts please help me..
1) when iam claiming principle and interest parts of 2 home loans, my office accounts dept. not considering both home loans and asking to show any one only. so that iam showing it in ITR while i file returns. but I’ve read that even if we show flat/house as let-out property we have to show some rent, which is nominal but it is decided by muncipality, it defers from area to area. is it true? when we wont get any rent and flat is vacant for years how can we do that? and whether we have to claim both principle amounts or only first one. could you explain tax implications and obligations indetail in this case. 1 – You can show both the houses as LET-OUT properties and also claim HRA as you are residing in a different location. So, you can claim tax benefits (full interest payments u/s 24) on both the home loans. 2 – If the property is vacant for full year then annual rental value can be NIL but you can not claim 30% standard deduction. Kindly read: Income from house property & tax implications. I came across your ReLakhs.com while googling a query and I am glad I did! Very prompt responses and simple and to the point explanations. Really good work you are doing. I have a question regd home loan and HRA. I took a home loan in Jan 2016. But not planning to occupy it till next year. We are staying in a rented flat now. I have claimed the HRA and tax benefit on interest and principal amount for 2015-16. While filing IT returns, I saw that if we want to claim tax benefit on interest we have to choose either of the options: self occupied or let out. In my case it is neither of them and I am staying in a rented flat. So can I claim HRA and tax benefit on interest and principal amount together for 2016-17? What option should I be filling in while filing IT returns next year? You may treat it as ‘Deemed let-out property kept vacant’ (Let-out) and claim total interest payments as tax deductions. In this case, the rental value would be NIL. Will do the same. Thank you so much Sreekanth! I have 2 houses in two different locations. One is vacant due to my posting in third location, second house is occupied by my earning son who is not claiming any HRA exhumation on tax. There is no loan on any of the house. Should I still show one house deem to be let out. I need to discuss few queries with regards to the Home loan tax calculations. I recently purchased a flat(on loan, under construction) in Jaipur and my job location is in another city, where I have another flat (on loan, under construction) which is on loan too. But this flat is also very far from my office location and not possible to commute (bad luck, my office shifted from this area). Currently I am staying on rent and claiming the HRA only (as both flats are under construction). 2. New flat – on loan, under construction, not possible to commute after possession(bad luck, my office shifted from this area). 1. Can I show claim the any Tax rebate now (because of two home loans, I heard 20%) and claim HRA all together ???? 2. If I will get the possession of the New flat, and I will show that on rent (As I cant stay there). Can I get some benefit after that on Two loans and HRA??? 3. I have read that, Wealth Tax in India has been abolished and removed from 1st April 2015 onward. In this case, do I need to pay any tax for for Mar-2015 to Apr-2016??? Please kindly advice me , I follow of your blog and your explanations over the queries. 1 – What is 20% here? Income tax benefits on home loans. Under construction property & Tax implications. Self-occupied property & Tax implications. 3 – Yes, wealth tax has been abolished. But you have to show the rental income (if any) in your ITR and pay the income tax accordingly. Property taxes are also applicable. 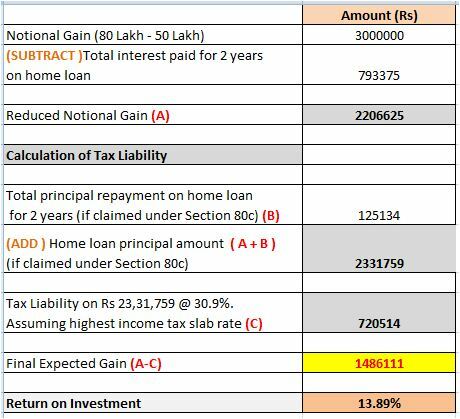 Please can you help me out to get the Tax calculation or planing for the home loan. The 20% I mentioned in the query is : I have bought two flats and and both are under construction and I am staying on rent. In that case, How I can claim the Principle and Interest for both houses. In the provided links, I am not able to locate the any justification regarding to the Two Home loans and both properties are under construction. Please help on this. Please can you help me out sharing details over the call or can let me know how to contact you. You can claim Prior period interest on both the properties after taking the possession. You can claim this in 5 installments, subject to aggregate limits applicable to self-occupied / let-out property under section 24. Thank you for the informative article Sreekanth. One item I’d like to point out is you friend would have made about 4.8 Lakhs over 24 months in rent (assuming 20K per month for a 3 bedroom). I thnk this would put his return in the 20% bracket. But I do see your point on greater benefits going long term. It is all in the assumptions.. Yes inflation indexation can be applied on Rs 19 Lakh. Long Term Capital Gain = Sale Price – (Indexed Cost of Acquisition + Indexed Cost of Improvement + Cost of Transfer). The interest on money borrowed for acquiring a Capital Asset will also form part of the Cost of Asset. Thank you dear Sameer. The real estate market is ripe for decent correction. Even the rental yields have fallen drastically. So my question is can i show my home town property as SOP and Job city as LOP and claim HRA all together ? If not can we claim two properties as LOP(will show notional rent) and claim HRA also ? Please kindly advice me , i am great follower of your blog and your answers are apt n simple to understand for a layman. Yes, you can do so. You can claim HRA too as long as you can justify your stand on this. The property in your native place is occupied by your parents, so it is SOP. Wealth Tax in India has been abolished and removed from 1st April 2015 onwards. I need an one on one advice for my NRI friend. Please provide an email address where I can reach you. You may kindly use http://www.relakhs.com/services/ link to reach me. Sreekanth, the way you are presenting the personal finance topics is simple & easy to understand. Keep going..
Prateek – Thank you.Share the posts with your friends too. You explained the tax implication very nicely. I do agree with you that property /real investment is not for short term gains. Investor need to do lot of home work for real estate investment.